The Ibis London Luton Airport is located only 600 m from the airport terminal, 10 min from the centre of Luton and 30 min from London by train Kings Cross station . The hotel has 162 rooms, 5 meeting rooms, a restaurant, a bar with a terrace offering li. ght meals and snacks 24 hours, 7 days and private outdoor parking at a fee of GBP 3.00 per resident. Wireless Internet access for business guests. 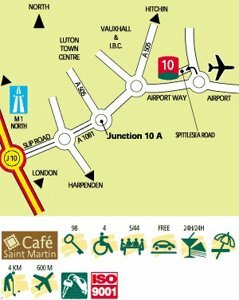 Located at London Luton airport, 10 min from Luton town centre. Situated close to Luton business centre and various theme parks. 10 minutes from junction 10 of the 1. From M1 Jct 10 follow signs for Luton airport. Hotel situtaed on left on approach to Airport. From M1 Jct 10 follow signs for Airport, Hotel situated on left on approach to Airport.